This handmade decanter is modeled after a musical horn’s coiled shape and is a miniature copy of the original Horn Decanter which was introduced to the market in 2014. The decanter is formed freely without the help of any molds, and proves extremely difficult to create. The horn’s form is mouth blown with two openings on either end, the larger of which is to be used for both receiving and pouring wine. 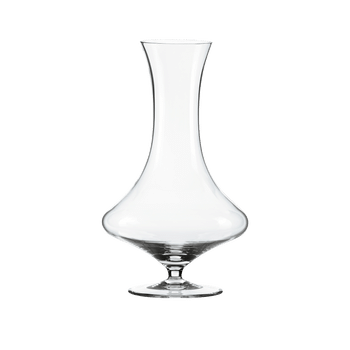 The decanter’s clear crystal color is accented by a large regal golden yellow stripe outlined by two black lines following the contours of its curved silhouette. Like RIEDEL’s many other coiled decanters the Horn decanter “double-decants” wine, a technology developed by RIEDEL to accelerate the aeration of wine by the creation of a vacuum within the vessel. The Horn’s coiled body brings wines to full flavor profile potential when decanted even more quickly than other RIEDEL decanters. Six limited-edition mouth-blown Mini Decanters, inspired by the best-selling handmade decanters produced in Kufstein are now available. They have been designed to hold half-bottles of wine. The size is perfect to drink one bottle of wine in two sittings for a perfectly decanted wine each time, and is also ideal for those with less storage. This half-sized Mini Decanter range offers a wonderful alternative to traditional sizes designed for larger bottles. Every piece is unique, made by hand and mouth-blown from crystal glass. RIEDEL whole-heartedly believes all wines - young and old, red, white or sparkling - can be enhanced by decanting.